(b) Glider pilots may substitute a minimum of three instructional flights in a glider, each of which includes a flight to traffic pattern altitude, in lieu of the 1 hour of flight training required in paragraph (a) of this section. (2) A logbook endorsed from an authorized instructor who gave the review certifying that the person has satisfactorily completed the review. (d) A person who has, within the period specified in paragraph (c) of this section, passed a pilot proficiency check conducted by an examiner, an approved pilot check airman, or a U.S. Armed Force, for a pilot certificate, rating, or operating privilege need not accomplish the flight review required by this section. (e) A person who has, within the period specified in paragraph (c) of this section, satisfactorily accomplished one or more phases of an FAA-sponsored pilot proficiency award program need not accomplish the flight review required by this section. 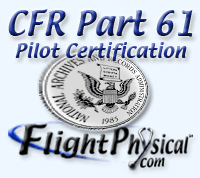 (f) A person who holds a current flight instructor certificate who has, within the period specified in paragraph (c) of this section, satisfactorily completed a renewal of a flight instructor certificate under the provisions in §61.197 need not accomplish the 1 hour of ground training specified in paragraph (a) of this section. (g) A student pilot need not accomplish the flight review required by this section provided the student pilot is undergoing training for a certificate and has a current solo flight endorsement as required under §61.87 of this part. (h) The requirements of this section may be accomplished in combination with the requirements of §61.57 and other applicable recent experience requirements at the discretion of the authorized instructor conducting the flight review. (1) The flight simulator or flight training device must be used in accordance with an approved course conducted by a training center certificated under part 142 of this chapter. (2) Unless the flight review is undertaken in a flight simulator that is approved for landings, the applicant must meet the takeoff and landing requirements of §61.57(a) or §61.57(b) of this part. (3) The flight simulator or flight training device used must represent an aircraft or set of aircraft for which the pilot is rated.